Seeing Majikoi S in VNDB, the seiyuu for Kawakami Momoyo and Christiane Friedrich is written as Kamishiro Misaki and Misaki Rina respectively. People that is not too into seiyuu might not know, but the seiyuu-otaku are very likely to know that they Kamishiro Misaki is Asawaka Yuu and Misaki Rina is Itou Shizuka. The first is even more easily recognizable by non-seiyuu-otaku and non-anime-otaku since she is the voice provider for the VOCALOID Megurine Luka. Heck, even people that doesn't know this would be able to find it relatively easily with some Googling. 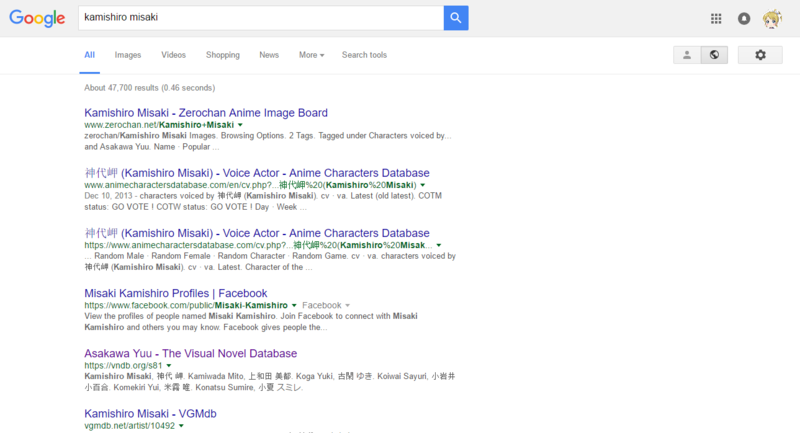 I tried entering the name Kamishiro Misaki in Google and the 5th entry states Asakawa Yuu's name. Misaki Rina is even worse. 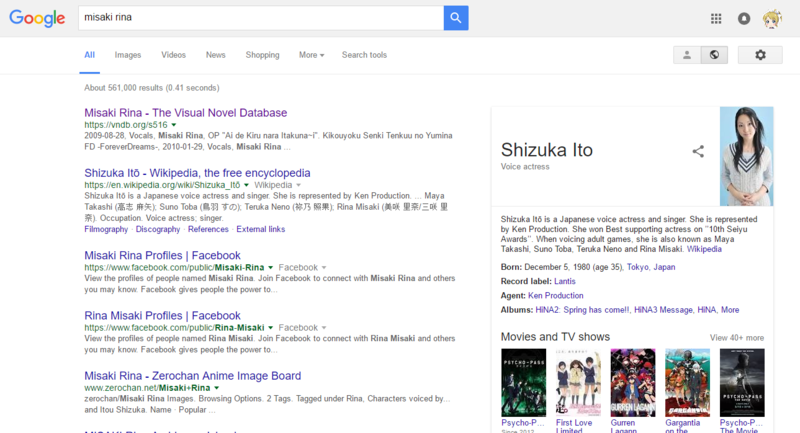 It clearly shows that Misaki Rina is Itou Shizuka. it doesn't take a genius to figure that it is them. This is apparently common in female seiyuus while many male seiyuus use their usual name even when voicing eroge. For example the BL Emperor, Toshiyuki Morikawa, uses his name, Toshiyuki Morikawa in most of his Visual Novel works even if the said work is a R-18+, such as Gin no Kanmuri Ao no Namida. Most, if not all famous female seiyuus use alias to voice R-18+ games. Examples other than Itou Shizuka and Asakawa Yuu would be Sato Rina, Goto Yuko, all use an alias when doing most of their eroge works. My question is, since it is clear that it is them, why do most popular female seiyuu still bother using alias when voicing eroge? Browse other questions tagged culture voice-acting or ask your own question. Who is the “emperor of BL”?